China’s beef imports are expected to rise by 12% for 2015 compared with 2014 levels, Business Monitor International (BMI) says. Bord Bia says that as the shortage of beef in China is believed to be structural, and to remain until at least 2018, demand for imported beef will continue to be strong. 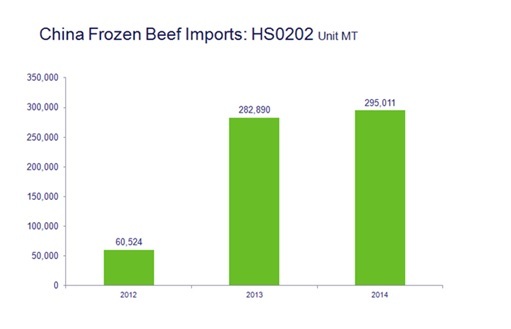 Cathy Zhou, of the Bord Bia Shanghai office, says that in 2014, official China frozen beef imports reached over 295,000 t, a slight increase over 2013. At present, only six countries are permitted to export beef to China with varied levels of access: Australia, Uruguay, New Zealand, Argentina, Canada and Costa Rica, she says. “The potential for the beef market in China is huge. Chinese consumers eat small amounts of beef, 4.5kg per capita in 2013 (weights on a carcass-weight basis), which is nearly half of the world average of 8.1kg, while consumption in Ireland is over 19kg per capita. “But the beef demand keeps rising across China, and the rising demand for beef will not been matched by Chinese supplies. It is expected that by 2020 per capita consumption of beef will reach 6kg in China. “Chinese cattle slaughter declined by 3.7 million head from 2008 to 2013, an 8% decline. Chinese agriculture is fighting for resources (feed, land and water), and one solution is to allow more beef imports. Moreover, China’s middle class has recently been estimated at near 300 million, and is expected to grow to 620 million by 2022,” Zhou said. In February, the Chinese Government approved access for Irish beef, creating opportunities in one of the largest and fastest growing markets, Bord Bia says. It also said that the demand for beef in China will rise over the coming years. Australia, with 45% market share, remained the largest official imported beef supplier to China in 2014 and Uruguay retained its position as second largest importer with 30% of the market share, Bord Bia says.